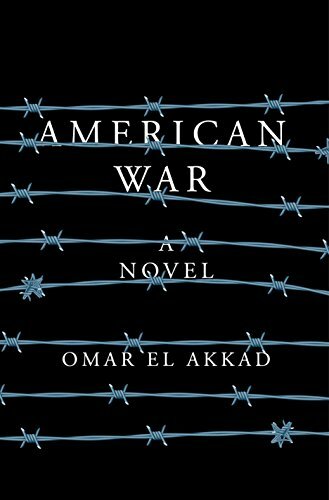 American War, the debut novel from Omar El Akkad, presents a highly plausible dystopia in the not so distant American future. The Second American Civil War erupts over a dispute about the nation’s energy future, with the North embracing green technology and renewables and the South clinging steadfastly to fossil fuels. El Akkad deftly places climate change as a primary force of national disintegration; the geography of this future post-coastal America has been permanently altered by climate change and geographic sectarianism, leaving the battle for American identity to be fought between the Midwest and the South. The new Northern (Blue) capital is Columbus, Ohio, and the capital of the Free Southern (Red) State is Atlanta. The landscape is dramatically different, but the tenor of the politics in the novel is eerily familiar. The newly dominant Bouazizi Empire of Middle Eastern and North African states united from the “Fifth Spring” Arab democratic revolutions is now seeking to manipulate a civil war in the once “soaring, roaring, and oblivious” America. Here, El Akkad not so subtly suggests the corruptibility of democratic states to imperial pursuits. He creates the theatre of conflict in which the novel’s protagonist stakes her claim. Sarat Chestnut is a fascinating study of the border between justice and ruthlessness. Sarat grows up in a small river town in Louisiana just outside the Free Southern State until her father is killed in a “homicide bombing.” Early on, she doesn’t display inclinations that portend political consciousness, but, instead, an inwardness leading her to a crucial choice: resistance as an existential imperative or capitulation to the meaninglessness of war, death, and the transience of life. Sarat spends her early childhood examining her surroundings, once pressing “her finger to the needles of a yucca plant,” and finding them “brown and rigid, immune to sun and storm.” It seems to her that nature is the constant, and it is meaningless. Consequently, she views sexuality as an ulterior concern, noticing the “dramatic concern for things that seemed inane and devoid of adventure: the color and style of skirts, the arrival of facial hair, the mysterious topology of flesh.” It’s an unusually extreme kind of seriousness for a kid her age; then again, this is an unusually extreme historical moment in which she finds herself. When her mother, Martina, moves the family to a refugee camp, the stage is set for Sarat’s radicalization. At the ominously named Camp Patience, Sarat and her family subsist, waiting for the inevitable Northern incursion where they will be slaughtered. There, she is radicalized by a savvy ideologue named Albert Gaines. He hones her igneous intensity into a fixed bayonet of insurgent rage. Here, her naiveté is on full display. Betraying her provincial roots, she’s just not suspicious enough of the overly smooth Gaines. And the clues are not few. At one point even, Gaines, wearing an unwrinkled suit, jumps the shark by offering her caviar. Still, it is clear she is more taken by the persona of Gaines than by his ideas, which are little more than a melange of nativist and anti-imperialist tropes. She sees in him a cultured man, a man in the fray and above it, and it would be hard for any sensitive young person not to find that alluring. But the real radicalizing moment for Sarat is when Northern Blues storm Camp Patience and murder scores of helpless refugees. El Akkad is excellent here in judiciously refraining from making clear whether it is Gaines’s ideology or the wanton carnage that radicalizes Sarat. When the Northern militias storm Camp Patience, she fights for her life, even relentlessly stabbing a foe until she can’t slash him anymore. Is this the inspiration Gaines imparted to her, or her desire to wreak vengeance on the marauding hordes from the North? After she draws her first blood, she cuts herself as a form of anesthetic as “the heat of life left the man, but she did not feel it.” She achieves the paradox of the revolutionary, of the insurgent, which is ruthlessness in the service of justice. One weakness of the novel is the lack of development of Sarat’s close childhood friend, Marcus Exum, who departs early for the safety of the North, where he eventually becomes a Union Blue officer. Later on, the two are reunited and Sarat feels genuine warmth toward him, even though he has chosen a life antithetical to everything she stands for. Nowhere does she show this same level of mercy or understanding for anyone else, and thus it falls flat. We all know the mere fact of being friends with someone in childhood is no guarantee of sentimental feeling later, especially in the context of the novel here, where Sarat’s entire identity if predicated on a fiercely sectarian orientation to the world. And that fierce devotion to radical insurgency should be her most noble trait, but, as the novel progresses, it proves to be the most damning. After she’s given up and betrayed by Gaines to the Northern forces, she is tortured in the “Non-Compliance Area” of the dubiously named prison, “Sugarloaf,” clearly a futuristic version of Guantanamo Bay. She is waterboarded and confesses to all crimes she’s charged with: “complicity in all manner of insurrectionist violence, things she’d never heard of before.” El Akkad here deploys a subtle critique of torture as not only immoral, but ineffective, as captives will say literally anything to make the pain stop — a direct critique of the Bush administration’s embrace of torture and Donald Trump’s lurid flirtation with it. Roughly the final quarter the novel is narrated by Sarat’s nephew, Benjamin Chestnut. It’s the end of the war, and Benjamin is the voice of a postwar generation sorting through its cultural inheritance. He’s intrigued and ultimately disillusioned by his famous, war-grizzled aunt, living again with her brother (his father), Simon, and his wife, Karina, on the family property in Lincolnton, Ga., not far from Atlanta. Over time, he gets to know her. He feels affection for her, but, frustratingly, he never can get to the core of who she is. She remains inscrutable to him. Ultimately, in adulthood, Benjamin concludes that Sarat’s will to fight was an act of mourning, a profound unhappiness born of helplessness and protracted, pointless struggle. He recalls one day from his childhood when he and Sarat went swimming in the river near their home. As they get out to dry themselves, he marvels at her body, that intricately austere record of the ravages of war, with its “strange rivulets of scarred skin that lined her upper arms and shoulders, dead-looking and paler than the rest of her.” When she was waterboarded, the sense of drowning overwhelmed her, and she couldn’t resist anymore. No one could. Drowning is universal. There are limits to resistance, even if there are no limits to one’s capacity to resist. Whether it be the metaphorical drowning of American cultural disintegration or the rising seas of a warming, carbon-clogged planet, Sarat’s lust for vengeance is a fight against rising waters sure to submerge us all. This may be the first time Aeneas is called Romanus, indicating the city his descendants were to found. Vergil casts his eye all the way to praise Augustus, in whose circle he was living and whose favor, we must suppose, he wished to obtain. In our post-colonial age we cannot help but see a more complicated story, find a different reading experience in these lines than did the generations of Victorian school boys who were raised on visions of a civilizing empire. But more of that in a moment. The sixth book of the 12-book Latin epic on the founding of Rome sits right on the cusp between its so-called “Trojan” and “Roman” halves, sometimes also called its “Odyssey” and “Iliad” halves. The first half features many of its most famous images:  the Trojan horse, the flight of Aeneas and his family with other refugees from burning Troy, the doomed love story of Aeneas and Dido queen of Carthage. These books echo the wanderings of Odysseus as he makes his way back to his home of Ithaca, except here Aeneas, propelled by the gods, is seeking a new home for his defeated people. After Book VI we see Aeneas and his wandering band of Trojans make land in Italy, setting the stage for war with the land of Latium, where he finds, Lavinia, the woman fated to become Aeneas’ wife (after he kills Turnus, his Italian rival). These books, again an echo of Vergil’s Homeric model in the Iliad, describe the events which Aeneas endured in order to fulfill his destiny. This is not the first time Seamus Heaney, who died in 2013 after an illustrious career, including the Nobel Prize in 1995, has tackled this book. In 2010, in a poem sequence called “Route 110,” Heaney used the underworld journey as a counterpoint to autobiography. A bus journey becomes his underworld, and Heaney brings out the father-son story embedded in Book VI reflected in his own life. The book proper is divided into roughly three pieces. First is the journey to the lair of the Sibyl at Cumae on the Italian coast, the prophet possessed by the god Apollo who will tell Aeneas’ fate; the second section deals with the burial rites for Aeneas’s comrade Misenus, who had challenged the gods to a musical contest and was drowned by Triton in anger (“Triton … inter saxa virum spumosa immerserat unda”/Triton was shaken with envy … and surged up/And drowned him in a sudden backwash of foam”). The final, longest section is the tour through the underworld where Sibyl acts as guide and where, at its climax, Aeneas meets his father, whose burial closed Book V.
In a short preface, Heaney writes that he treated book VI separately out of a somewhat Roman sense of obligation:  ”The translation is more like “classics homework, the result of a lifelong desire to honour the memory of my Latin teacher at St. Columb’s College, father Michael McGlinchey.” This is not false modesty; even a workable translation of Vergil is no mean feat, but once Vergil’s style is grasped, some rough translation is not that difficult, which is one reason the text has long been used for students (cultural training for imperial administration was, of course, another). Heaney marked the draft that forms the basis for this text as “final;” as Catherine Heaney and Matthew Hollis, who brought the translation to publication, the text is as Heaney intended it, barring final revisions prior to publication. The gods want what they want. Heaney’s is the more literal here, and the clearest. But this second version (translated by David Hadbawnik) has more contemporary punch. In retrospect, it is hard not to see the conflicted vision of imperial glory reflected in the poem. Perhaps, even if unwittingly, those Victorians were right to focus on the Aeneid after all. Any American who participated in the torture of other human beings should be charged with war crimes and sent to prison for the rest of their lives. Waterboarding is not torture per se. It’s not very nice but neither is decapitation. If waterboarding elicits information from terrorists, as I have read it does, who could possibly be against it. I am reading this book, although the reviewer details the plot so extensively, that I wonder if it’s necessary to read anymore. That aside, unlike other tedious dystopian fiction, what I like is the author’s well thought out political reasons and aftermath. And I like how he turns the world on its head: Americans in need of NGO’s and charity from across the ocean. And for gods sake – waterboarding is torture. You’re wasting your time. It has been widely reported and accepted for years that waterboarding doesn’t work, not to mention being considered torture by almost any sane worldwide governing body, including the UK and the UN (and China, for that matter). Even noted GOP legal authorities like Mancow and Jesse Ventura have undergone it and described it as torture, along with actual torture victim John McCain. Kirk is ably demonstrating the titanium impregnability of the Fox News/Hannity/Breitbart info bubble, in which the greater the amount of real world proof, the greater perceived conspiracy and plunging of head into sand. Don’t argue with idiots. Takes up too much of your time and they are immune to reason. They have their heads up their asses and they intend to keep them there. They like the view. Every member of the American armed forces is a terrorist, and every American president is essentially culpable in genocide. Stop pretending that your “soldiers” do any good in the world. One day you (and lots like you) will figure out who is actually funding/ exploiting/ ordering these decapitations and it will shock you to your core. You could show people like Kirk a picture of an ISIS / US Military picnic / volleyball game and they still wouldn’t believe it. They’re riding their media-induced hallucinations (and that included ALL media, not just ‘the mainstream press,’ which has to be one of the better misdirections perpetrated by the Trump Admin., that the mainstream press – who got him elected with 2 billion worth of free advertising – is somehow the opposition) all the way to the end of the line. And what’s at the end of the line? The end. For everyone. What America has done in the Middle East over the last 27 years will be considered one of the greatest crimes in Modern History once the books are written. And as an American, I hate to say this, but we are all culpable. Sad, but true. On one level I agree, but, on another, I feel that lets the actual button-pushing, decree-signing perpetrators off the hook. We’re all culpable to the extent that we went along with it for so long but, on the other hand, that Propaganda was pretty strong stuff… it came in our grammar school textbooks and in our favorite movies and TV shows and pop songs, too. We of “the West” have been carpet-bombed with mind-altering Propaganda since before we could walk… we belong to that weird category of Accomplice/Victim. We should be sentenced to the terrible punishment of taking a hard look at ourselves. But the “leaders” (figureheads) and their (corporate/ banking) Masters need to go to prison. They won’t until we all realize it.